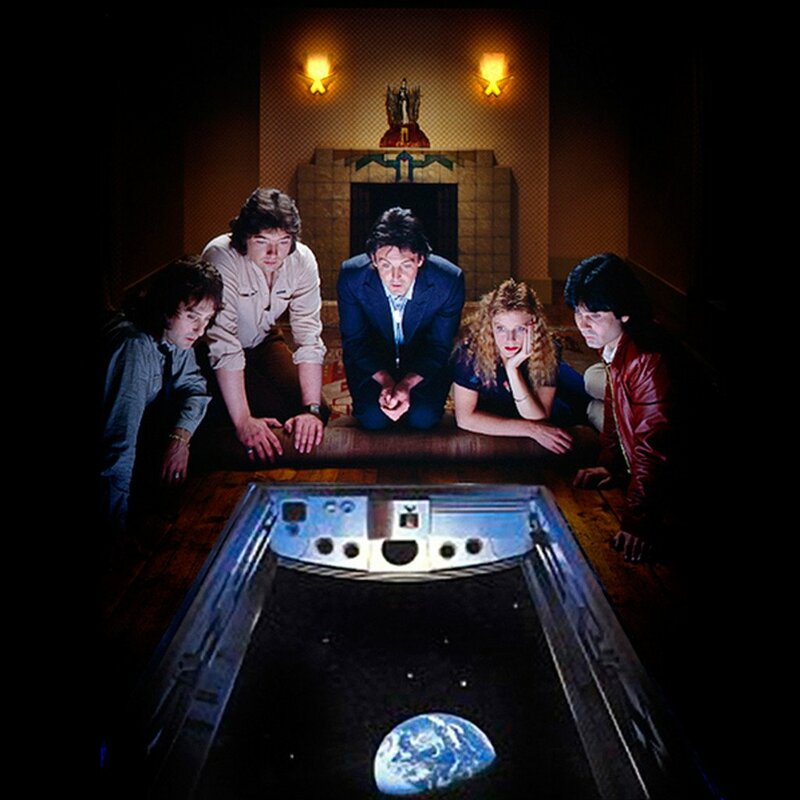 Rumour section: I heard recently that the two remaining Wings albums, "London Town" and "Back To The Egg" are next up, and will be released to the 2019 Christmas market. Let's just hope that a Wings live 1979 edition will be included with the regular DeLuxe and not in a very limited edition special edition like the Wings 1972-73 disc was. Wings members Steve Holley and Laurence Juber have both given their input years ago to the "Back To The Egg" re-release. Meanwhile, the archive edition of "Flaming Pie" has also been finished for years, but has yet to be scheduled. Also, and this is not a rumour, Mike McCartney is working on the ultimate version of his "McGear" album, which was a Wings album as good as any, just with Mike handling the vocals and writing the songs. Here's a Wings live rendition of "Wonderful Christmastime" to get you in the mood for the festive season, hopefully one of the tracks up for official release next year. 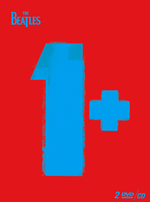 When Paul McCartney announced the European leg of his "Freshen Up" tour, I didn't even think about it. I had booked a three week family holiday in USA months earlier, so I knew I wouldn't be home when he was due to play Copenhagen, Denmark, which would be the closest to where I live. I happily accepted this fate, even though I would indeed have liked to see and hear him with the new horn section. When the tickets went on sale, it was quickly sold out - within minutes in Denmark, Liverpool and London, which were the ones I monitored. A large contingency from Norway travelled to Denmark for his gig there, and a couple of them even attended the soundcheck. 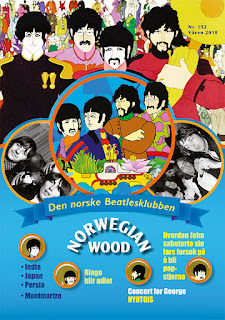 I kept tabs on this, because even as I was vacationing, I was involved in putting together the "Norwegian Wood" Beatles magazine, which I am editor-in-chief for. After three weeks, it was time to go home, and we landed in Norway on Saturday, December 8. Assuming my duties as a blogger was not on the agenda for a few days, I had too much to do elsewhere. Meanwhile, McCartney and his gang descended upon Liverpool on December 12th, and through Facebook and friends in Liverpool, I was kept up-to-date about the concert. It was Quarryman drummer Colin Hanton's 80th birthday on the day Paul played in Liverpool, and the two old band mates met up again backstage, thanks to the organisational skills of Freda Kelly. Upon playing "In Spite of All The Danger", which featured Colin on the original recording, Paul mentioned him during the introduction at the show. Very nice. I don't think they had seen each other for the past sixty years. 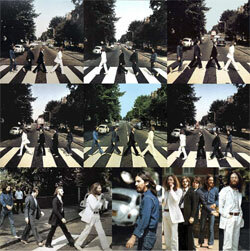 There was some anticipation now that Paul was in Liverpool, was he going to show up at Roag Best's new Beatles museum? I don't think he did. 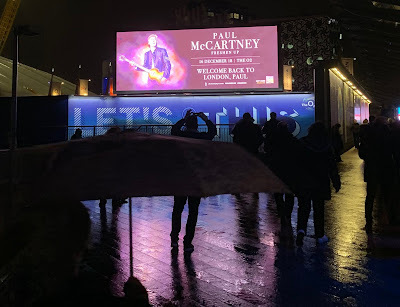 Anyway, come Friday the 14th, I got word that a friend suddenly had a spare ticket for McCartney's show in London on Sunday the 16th, just two days later. His mate could no longer accompany him, due to sudden illness in the family. A couple of phone calls later, I had a flight booked and Sunday morning I was on my way to London! 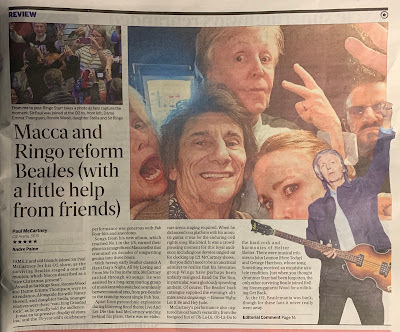 I did actually have three Norwegian friends to meet in London, all of whom I had been to previous McCartney concerts with. In fact, I had recently made a list of all the times I had seen McCartney play live since I first saw him on Live Aid in 1985, and the count stopped at 29. This was going to be my Macca gig no. 30! I knew we didn't have very good tickets, we were all going to sit in the nosebleeds of the 20 000 capacity arena, I heard it was the biggest indoor venue in the world. Still, we counted ourselves lucky to be there, and there were rumours about a special guest appearing on stage tonight. 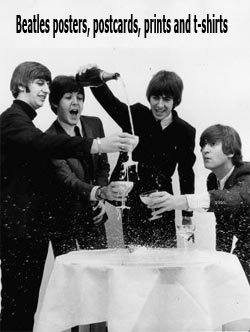 We were all hoping that it was going to be Ringo. This because the last time we all were in the O2 at a Christmas McCartney gig back in 2009, we had spotted Ringo in the audience - and one of us actually shook his hand! 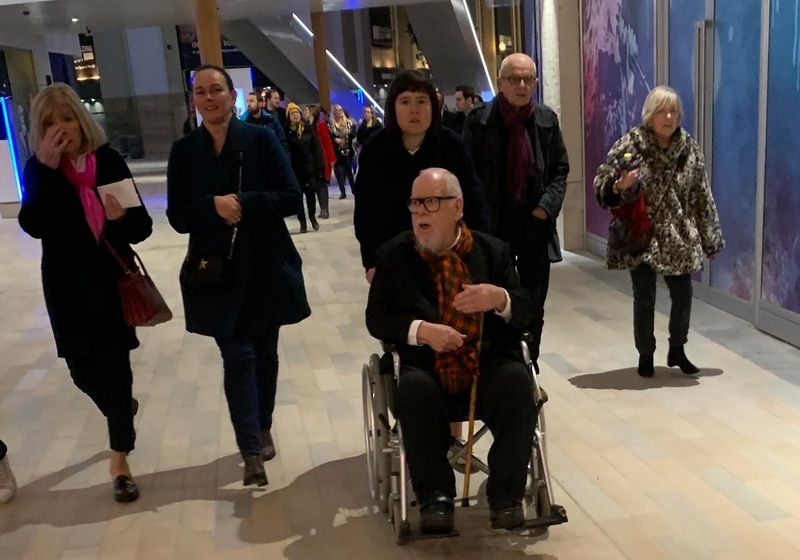 Arriving at the gig, we noticed Sir Peter Blake being wheeled in, as one of Sir Paul's guests. 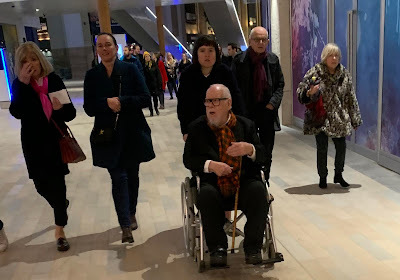 Sir Peter Blake arrived at the same time as us. We took a look at the merchandise, but we only bought a couple of programmes, I didn't bother to get anything. My collection is already bigger than I'm able to keep on hand. A big merchandise stall just by the entrance had the biggest selection - I think they even had the green vinyl "Egypt Station" - but also the biggest queue, so none of us bothered. The people on the stage looked really tiny from as far back as we were, and even the big screens were partly obscured by the stage lights rig. Very early on in the show, we heard rumours that Ringo had been spotted in the audience. Good news travel just as fast as bad news. 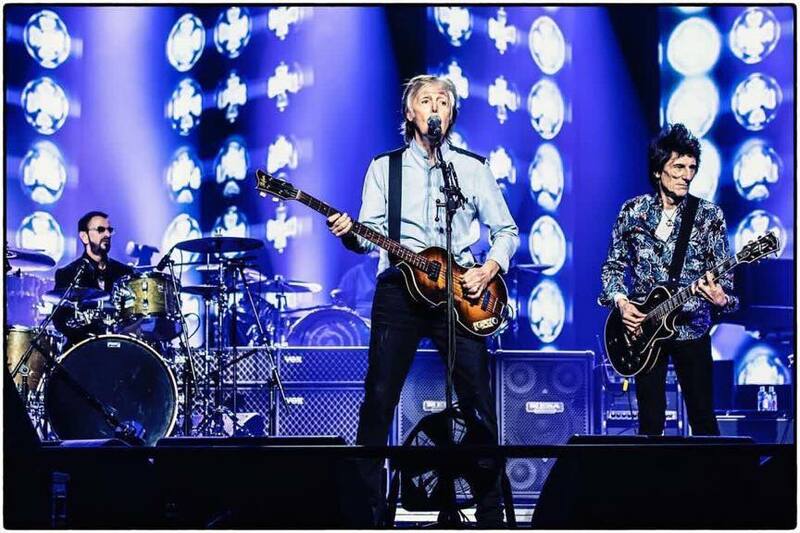 The gig was great, and fortunately, in concert Paul's voice sounds deceptively good, quite better than when one reviews the recordings of it. The addition of a horn section was very successful and added a great new dimension to the songs they were featured in, like "Letting Go" and "Got To Get You Into My Life". Now how about adding a string quartet, Paul? The Wings songs went down really well with the audience, as always in London. Lots of Londoners were Wings fans back in the seventies. 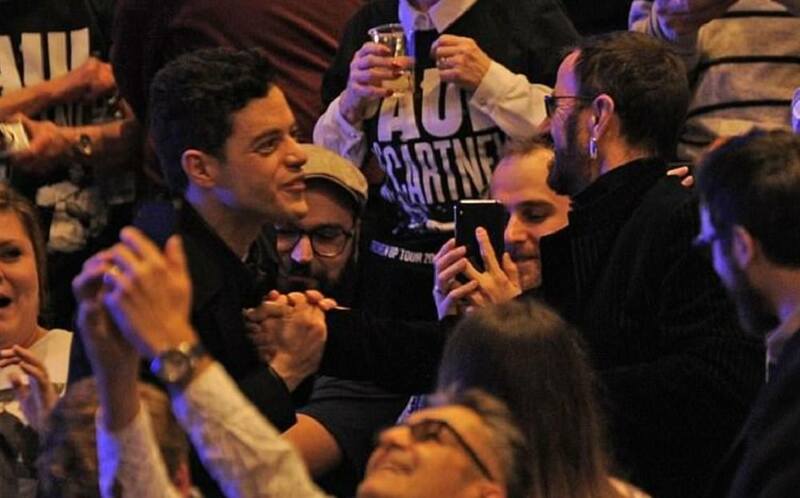 There was a generally good feeling in the audience anyway, even the new songs were cheered and applauded. I streamed some songs on Facebook from my iPhone. Of course, Paul's stage banter was the same as always, with the same old stories, but at least he acknowledged it this time, as he told us he had met a Japanese fan who had attended 121 McCartney concerts. So he did mention that the stories he told were mainly meant for those who hadn't seen him in concert before. There must have been a few of those, because after the rousing singalong of "Hey Jude" quite a number of people made their way to the exits, even during the song. Of course, we knew better, and were still hoping for that "special guest". By now of course, you will all know that the special guests this evening turned out to be Ron Wood and Ringo. 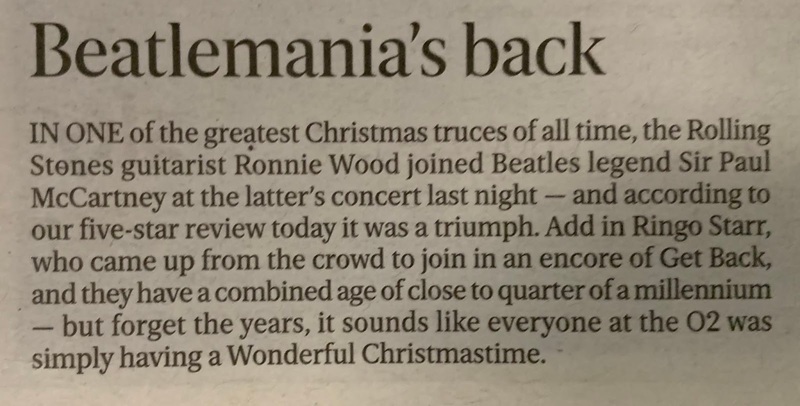 After a nice version of "Wonderful Christmastime", featuring the Capitol Children's Choir, Paul introduced "Ron Wood from the Rolling Stones" to big cheers, but when he introduced Ringo, the whole audience got on their feet and gave the biggest round of applauds of the evening. 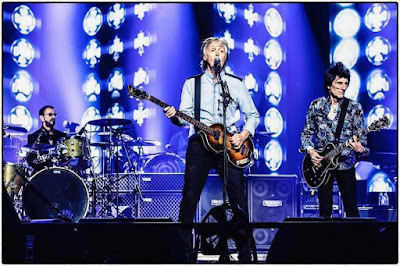 I filmed and streamed the whole thing on Facebook, and also posted it on The Daily Beatle Facebook page, but as my view was from way back in the arena, I have found another nice video for you, edited from several sources. It was really touching to see the two remaining famous Beatles friends back on stage together, something I had personally witnessed just once before, at the Concert For George. 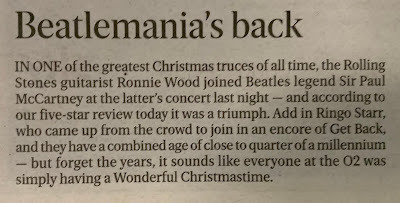 The editor seemed to think there's a war going on between the Beatles and the Stones.